This poem was composed by the Dharma Master Saigyō (1118-1190) a famous Buddhist monk and poet from the era. Saigyo’s story is interesting in of itself. In his youth, his name was Sato no Norikiyo and he was a promising young man in the Heian Court, and caught the attention of Emperor Toba, Emperor Sutoku (poem 77) and also Taira no Kiyomori, the most powerful man at the time and who later became a villain in the famous Tales of the Heike and a recent drama on Japanese TV. However, Norikiyo grew disillusioned with the nasty politics and infighting in the Court, and abruptly decided to throw it all away. He left behind his career, his wife and children1 and became a wandering mendicant. He took on the Buddhist name Saigyo (西行) and stayed at the famous mountain-monastery of Koyasan for monastic training. Later, he returned to the capitol to find everything had changed. The Hogen Rebellion had destroyed much of the capitol, Emperor Sutoku was exiled (having lost), and Kiyomori ruled as a warlord. A few years later, Kiyomori and the entire Heike clan were utterly destroyed in the famous Genpei War which also spelled the Heian Court and the Heian Period. What might have happened had Norikiyo had stayed and followed his career, rather than leave the capitol? In any case, with the new samurai government at Kamakura (the Kamakura Period), things settled down in Japan and Saigyo traveled around, devoting his life to writing poetry to lament the loss of his former patrons, beautiful nature in Japan, and about life in general. He finally settled down in the outskirts of Osaka, and passed away at the age of 73. It was said that when he passed away, the cherry blossoms were in full bloom and that he died on the same day that Shakyamuni Buddha died (February 15th according to solar calendar). He was also friends with Shunzei (poem 83), according to Professor Mostow. Anyhow, this poem is, according to Professor Mostow, possibly inspired by a poem by famous Chinese poet Bo Juyi and is supposed the express the feelings of a resentful lover. 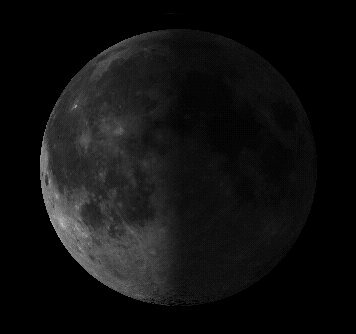 Is the moon making him/her tearful? Maybe, maybe not, but gazing up at the moon brings them such sadness anyway. Saigyo’s talent with poetry and his interesting life story have certainly helped him earn a place in the Hyakunin Isshu, but also inspired many later poets such as Basho and others. Basho the Haiku master, in his travels, went to visit places frequented by Saigyo among others. The author, Fujiwara no Kintō (966-1041), was one of the top poets of the Heian Period. In fact, the Thirty Six Immortals of Poetry above was compiled by him. Kinto compiled many anthologies that still represent Japanese Waka poetry of that era. In short, Kinto was the ultimate authority on Japanese poetry of his time. He is also the grandson of Tadahira (poem 26) and father of Sadayori (poem 64). According to Mostow, the poem itself was composed after a number of people visited a famous Buddhist temple called Daikakuji, which is in the western part of the capitol of Kyoto. Interestingly, Mostow also points out that this poem is found nowhere else despite the fact that Kinto was a famous poet and had an extensive collection for Fujiwara no Teika to draw from. On suggestion is that Daikakuji is in the same area as Mount Ogura, which is where Teika’s villa resided. The full name of the Hyakunin Isshu anthology is actually the Ogura Hyakunin Isshu by the way. In any case, this poem is pretty interesting because of the sense of change over time. The waterfall that existed long ago still exists, but in name only. In the same way, life as we know it know will become a dim memory or a misplaced name for future generations. Although Japanese culture has been influenced by Buddhism and its notion of transience since early history, I think this is a point that anyone, anywhere can appreciate. the wan morning moon has come out. This poem was composed not by a woman as one would expect, but by a Buddhist priest named Sosei Hōshi (素性法師, “Dharma Master Sosei”, dates unknown) who was the son of Henjō who wrote poem 12. Sosei was a prolific and popular poet and according to Mostow heavily represented in the more official anthology, the Kokin Wakashū. He is also one of the Thirty-Six Immortals of Poetry. As we’ve seen with other poems from this earlier era, it was common to write about poetry themes, and to write from a role outside one’s own. So, for a monastic to be writing from the perspective of a lonely woman wasn’t unusual. Mostow explains the contradiction in this poem between the “one long night” and “months” as being an issue of interpretation. Though most people assumed it was a long Autumn night, Fujiwara no Teika, the compiler of the Hyakunin Isshu anthology, felt it was more like a long passage of time. P.S. Photo above is a Japanese calendar we have a home. More on that in a related post in my other blog. “in this timber forest that I enter”. The author of the poem is by a priest of the Tendai sect of Buddhism named Saki no Daisōjō Jien (先の大僧正 慈円, Former Archbishop Jien, 1155-1225) who was the son of Tadamichi (poem 76) and nephew of fellow poet Yoshitsune (poem 91) as well as Fujiwara no Teika himself. The last line of the poem is noteworthy because it is a direct quote from the founder of Tendai Buddhism in Japan, Saichō who lived centuries before. So, for many, this has been interpreted as Jien’s vow as a monk to carry on this tradition of compassion for all beings in a world that is transient and marked by suffering. Here, the “ink-black” or sumizome (墨染め) literally means “ink-black” (sumi is Japanese ink), but also is the traditional color that Buddhist priests in East-Asia wear. Compare with the more ochre robes in Southeast Asia or red robes in Tibet. This notion of compassion for all beings is exemplified by the Buddhist notion of a bodhisattva who is a being who is highly advanced on the Buddhist path and has turned outward to help and teach all beings before becoming a Buddha (i.e. enlightened) themselves. Tendai Buddhism, in particular, reveres the Bodhisattva ideal and practices, and not surprisingly the poem reflects this. Interestingly though, Professor Mostow suspects the poem may actually be an allusion to Emperor Daigo, who was said to have taken off his robe one winter night to suffer the same cold as the people did. In any case, the notion of good will and compassion for others is something I hope anyone finds inspiring. P.S. Photo is of a statue of Jizo Bodhisattva, a popular bodhisattva in Japanese culture, taken at Ueno Park in Tokyo. I think I took this 2010. The author of this poem is a monk named Ryosen Hōshi (良暹法師, “Dharma Master Ryosen) who supposedly composed it while doing austerities in a remote hut outside the capitol. An Autumn Sunset means a lot of different things to a lot of different people, but it still is significant one way or another. For me, I tend to like Ryosen’s imagery the best, and it’s the one I imagine whenever I read this poem. This poem was composed by one Semimaru (蝉丸) who is reputedly a blind man who built a hut near Osaka Barrier and was famous for playing the biwa, but the authenticity of this story if questionable, and as Mostow points out, it’s not even certain he existed at all. The story about his life has also changed throughout the generations, so in some cases he’s the servant of the son of an Emperor, and in others he’s the son of an Emperor, abandoned by his blindness. The place in question, Osaka Barrier, is a popular subject of poetry from this era. Poems 62 and 25 also mention the same place because it was a popular meeting spot for people coming and going from the capitol (modern-day Kyoto) eastward. Note that this Osaka has no resemblance to the modern city of Osaka, which was called Naniwa during that era. In fact the name of Osaka Barrier is also a pun. The chinese characters are 逢坂, which means “meeting hill”, but is also the place-name. 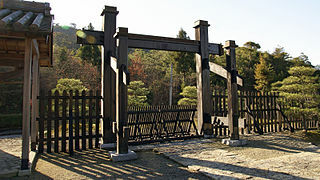 A traditional Japanese checkpoint or “sekisho” 関所 courtesy of Wikipedia. Anyway, these kinds of check-points, or sekisho (関所) existed in Japan across major roads going in and out of the capitol, but were also popular meeting places for friends and lovers too, as well as having inns nearby for weary travellers. Osaka Barrier in particular was the first check-point leaving eastward from the capitol, so many people probably parted company here, or met old friends at this particular gate more than others. It’s fun to imagine what Osaka Barrier was like in those days. As Mostow points out, this poem probably was originally just a poem about Osaka Barrier, but by the medieval era, it took on an increasingly Buddhist tone in symbolizing the coming and going of all phenomena. Even modern Japanese books on the Hyakunin Isshu tend to reflect this sentiment. Pretty interesting metaphor I think. of one weary of the world,” I hear. The poem was composed by a Buddhist monk named Kisen Hōshi (喜撰法師 lit. “Dharma master Kisen”) who lived in the mid-9th century. This is the only poem known to be his, though others may exist. He is considered one of the original Six Immortals of Poetry and is mentioned in the preface of the official anthology, the kokin wakashū. The location is a place called ujiyama (宇治山), which was associated with sorry or grief, though since then it has been renamed in honor of its resident and is now called kisenzan (喜撰山). Someone did a really nice write-up on their visit to Kisen-zan with photos and a view of what is purported to be Kisen’s original hut. Also, the famous Buddhist temple of Byōdōin also can be found there. It was located south of the capital at the time, Kyoto. The poem is a tricky one lends itself to two possible interpretations according to Professor Mostow. One interpretation has been that Kisen came there out of grief and weariness of the world, and made it his home. Mostow provides evidence that instead, Kisen lived there contentedly, and only heard from others that it was called brief mountain. As there is a Buddhist tradition since the time of the Buddha to withdraw from the entanglement of the world, and find peace of mind. This tradition has led to the Buddhist monastic community that exists today in various parts of the world. Kisen is one of many who sought solace in places like Ujiyama. Question is, did he find only sorrow, or did he find contentedness? Maybe only Kisen will ever know that. University of Virginia's online edition The U of VA’s translation of the Hyakunin Isshu, easy to search and modern reading. A Gorgeous Tribute to the Hyakunin Isshu Here you can find excellent illustrations, summaries and even links to locations via Google Earth. University of Kyoto Article Talks about the poetry collection, and a musuem devoted to it.